Without awaiting a response, the man putters around the simple dwelling built into the side of a small mesa, seeking refreshments for the weary travelers before him. He sets a plain wooden bowl, stocked high with various fruits, and a bowl of water on a table and gestures warmly to help themselves. Fortunately for these travelers, the man’s choice of residence provides some comfort from the fury of the sun outside. The inside of the dwelling is simply decorated, with shelving appearing to be carved into the stone walls. He has small rugs and simple wooden chairs and tables. Most remarkably, he has books. These books are a puzzling sight, considering most common folk can pass an entire lifetime without having read a written word – let alone an entire book. He holds his hands out, palms up, in a gesture of openness. After a beat, he straightens his posture and draws in a breath. He appears to be determined, drawing strength from some long stored reserve of fortitude. The entire world is a desert. Eons ago, Athas was thriving and lush but somewhere along the way, that changed. Even basic metal for weapons is nowhere to be seen. Nobody knows why, as written records don’t exist. The world has pockets of civilization and farmland (if you can call it that), but beyond those boundaries is a wasteland full of raiders, monsters, and who knows what else. Though, some would prefer wasteland living to being ruled in the cities by tyrant sorcerer-kings. Living in such conditions has hardened the hearts of its citizens, many of whom spend their lives in slavery. Magic doesn’t work the way it does on other worlds. The planet has been scarred by the use of magic in ancient wars and reacts negatively to the casting of arcane spells. To do so requires drawing strength from the very world itself, leaving the ground barren and useless after the spell is cast. Due to this, wizards, sorcerers, and wielders of arcane magic are nearly universally reviled and persecuted. Without magic being present as we know them, psionic powers are common. There are no gods. They have been silent and absent from Athas for as long as anyone can recall. Perhaps they turned their backs and followed whims incomprehensible to mere mortals, or perhaps they simply no longer exist. No clerics, paladins, or prophets exist. The only evidence that the gods were ever present is the crumbling ruins of once grand shrines. In the place of gods, people revere the primal forces of the world. Familiar races aren't so familiar. For example, elves aren't wise forest guardians - they are nomadic raiders, herders, or thieves. Halflings are cannibalistic and xenophobic. Divine characters MUST be reskinned! How did you come to reach paragon? What are your most notable exploits? How Daclamitus hear of you? Why did you respond to his request? What is one thing you would like to see change for the better on Athas? "By tooth and claw, we take what is ours. Give to Gnarglenog what is Gnarglenog's!" Leads us brave and true! Now come along and hear what he can do! But why we love him most of all? 'Cause he's the biggest gnoll of them all! Or he'll turn you into stone! "Good King" Gnarglenog is the current Pack Leader among a large contingent of Gnoll marauders as well as the successor to the posthumously titled "Bad King" Gnorygg. 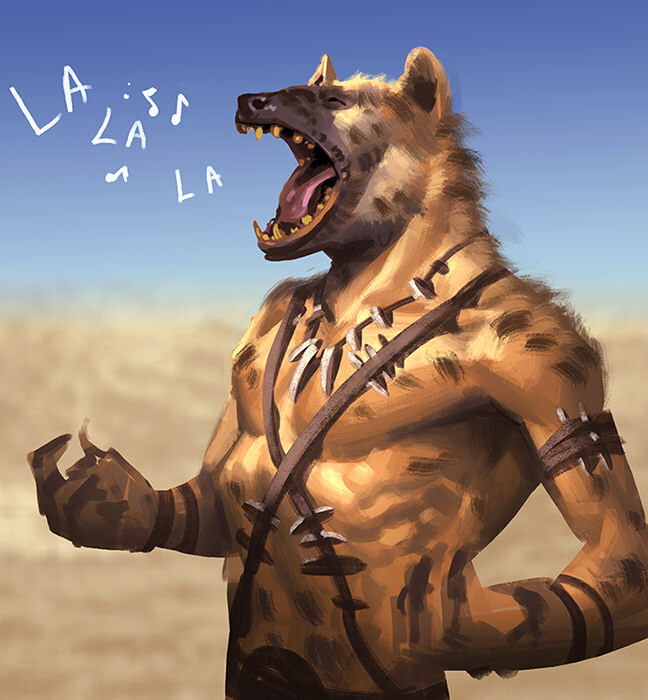 Gnolls, being a carnivorous war-driven race not against eating carrion or other humanoids, are well-adapted to the harsh lifestyle that comes with living along Athas' myriad wastelands. 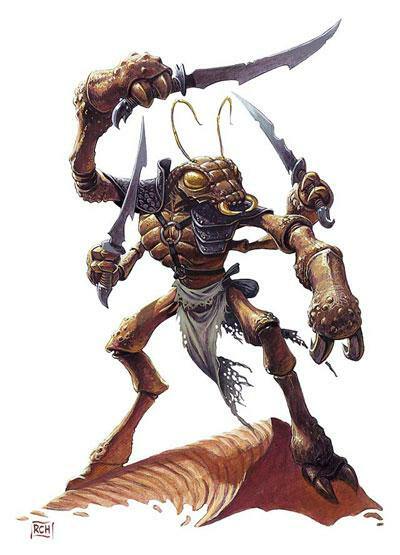 While generally lacking in education and wit, they are ferocious and deadly in great numbers, and thus these creatures have forcibly carved out a niche as bandits and raiders, a role heretofore only occupied by the Thri-kreen and particularly desperate humanoids. Gnarglenog, like any gnoll that has come of age within the pack, was expected to provide for the pack and take only after those above him within the hierarchy have had their fill. Being on the lowest rung of the ladder, this would mean needing to work harder and bring back larger shares so as to leave more and more excess for them to consume. However, while on an expedition to track and obtain a large quarry, the canine had an epiphany upon biting into the corpse of a "lost" traveler: this meat was his kill. The pack, of course, deserved shares as well, but as the one whom lead the hunt and ended the fight, they should by all means have the first pick of the various cuts this could make. Armed with this newfound knowledge, Gnarglenog began to show their distaste for the system by wrestling with his superiors over their portions, using techniques found among the belongings of the psionically-gifted corpse that gave him this initiative in the first place. Rising to ever higher ranks through displays of dominance and increased physical presence, his size beginning to be notable even among his fellow gnolls. As he continued to study the (admittedly difficult) words within the martial arts manual, he also began taking up some of the non-combat practices within, including meditation, philosophical theorizing, and concepts such as 'honor" and "humility." These qualities culminated in a formal challenge to Gnorygg, an alpha of 26 years, still no weaker than when he was a decade ago. Based on these principles of "honor," Gnorygg had been taking more than his fair share from the pack, abusing pack members, and failing to understand that a leader must be respected as well as feared. Gnorygg, being the dishonorable sort he was, opted to instead have every alpha who would listen to his shouts attack this upstart. With the creation of a flindbar fashioned from objects obtained during raids, Gnarglenog incapacitated his opponents without death or permanent injury, taking each cut in stride as he flowed from one alpha to the next. Finding an opening, he rushed up to the throne of bones upon which Gnorygg was seated, and delivered a thrust with his open claw. What happened next was nothing short of legendary: the movements of Gnorygg's fleeing body slowed, and his face became one of abject horror as his fur and skin began hardening, turning into solid stone. With one final step forward, Gnorygg had sealed his fate, as the weight of the statue caused it to topple over and crash, cracking and shattering into multiple distinct pieces. Ever since then, Gnarglenog has taken the role of Pack Leader, and lead the Gnolls to a decidedly less savage existence. Those who wish to travel among Gnoll lands, rather than fear being assaulted and devoured for merely being spotted by them, instead may choose to pay a tithe of meat and other sundries in exchange for non-harassed passage. However, those who instead choose to leave from whence they came fear no attack, and Gnarglenog has gone out of his way to punish those whom ambush caravans or attack those whom have already paid their dues, often leaving his post in order to make negotiations or discuss matters with the humanoid races in-person. A rather noble savage, as it were, and one who understands that senseless destruction will eventually result in nothing left to pillage and the destruction of both their way of life and, eventually, their lives. Perhaps that is why Daclamitus saw fit to send an invitation to the Good King: he sees someone who understands the value of a lasting community and the flourishing of life. Imposing as he is, Gnarglenog may yet be exactly what Athas needs; a firm hand to take back what has been squandered for thousands of years and put it to proper use. While certainly not the noble knight one would ideally see set upon this type of quest (Gnarglenog still ultimately finds killing fun and has no qualms about eating that which once had sentient thought), in these trying times, can one truly pass up the opportunity? 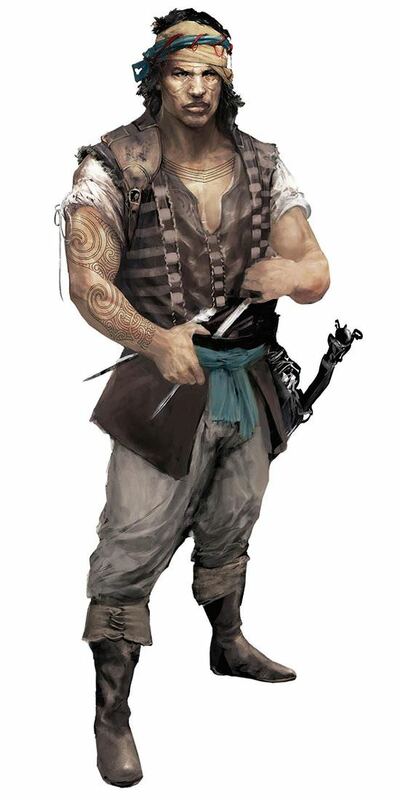 Gnarglenog, as stated in his backstory, gained his experience and strength of character by climbing the pack ladder and training with equipment and manuscripts left behind by a traveling monk he had devoured early on in his raiding days. His most notable exploit was defeating the previous pack leader by turning the Gnoll to stone, a feat he still has yet to replicate to this day. When a bunch of wild animals who eat carrion and kill anything they can see start acting like a civilized nation-state with toll roads and trade agreements, people take notice. While still a toss-up between themselves and the Thri-Kreen, Gnarglenog has done a lot of good towards giving Gnolls a chance at having non-hostile relations with other settlements and races. Upon receiving a letter that complimented him and offered him a new challenge, by his own (likely twisted) interpretation of honor, the Good King could not refuse said offer, lest he be shown as weak or hypocritical for allowing a piece of paper to deny him whatever reward it promised. Gnarglenog wants Athas to be a world with more vibrant wildlife. If there was more nature, there would be more animals. With more animals means more meat to devour. This abundance of meat would then lead to needing to eat fewer people, which is less about morals and more about being able to be self-sufficient: relying on tributes and idiotic trespassers from other races means relying on something that isn't guaranteed to last forever, and could be taken away at any time. Still better than just eating everything that passes by and then starving when no one decides to use their routes any more, though! Tawil isn't exactly well known for his deeds far and wide across Athas and that's how he likes it. His line of work doesn't abide those who can't keep the secrets of their clients. For those in the know however, Tawil is a fair businessman with a bag full of contraband in one hand and a blade in the other ready to gut those who would dare to cross him. Born in the aeries of the Ringing Mountain to a clan of Aarakocra, Tawil was quickly abandoned after his birth. Having been born without wings like the rest of his race, Tawil was an obvious bad omen that needed to be disposed of. Lucky for the fresh chick he was found on the mountain side by a pair of hermits. Less luckily the hermits raised Tawil as a servant, sending him out onto the mountain to do harvest what little bounty it had to offer. 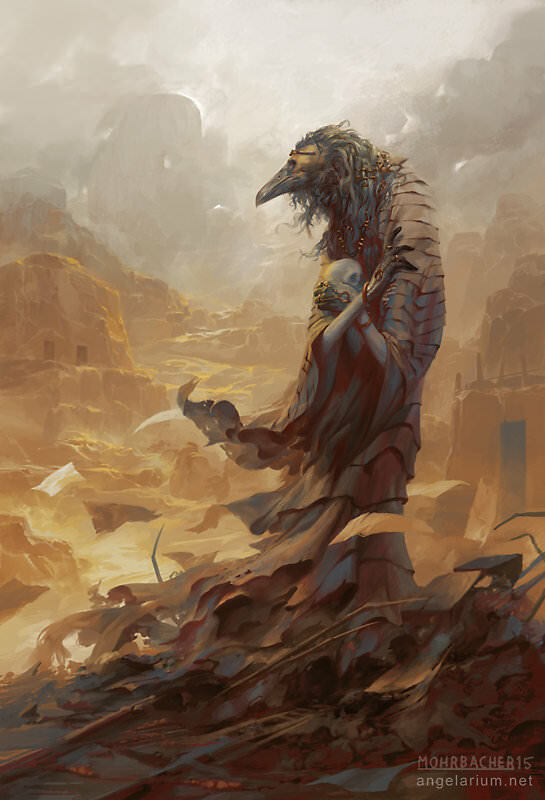 The hermits, a pair of druids who had been run off from their oasis by silt runners many years before, were mad but they knew they ways of the wilds well and Tawil was a sponge waiting to absorb the knowledge he needed to survive the wastes. After years of servitude to the hermits, Tawil's reward was to be turned loose into the desert. Unable to flee higher into the safety of the mountain for fear of the ravenous Halflings, Goliaths and his own vicious kin; Tawil made his way further down intent on heading to the city of Tyr, visible from the hermit's perch on the mountain. Tawil's journey to Tyr wasn't a safe one however, as an oddity meandering the desert he was quickly snatched up by a roving brand of elves. His next few years were a blur, sold as a curio from city to city, liberated by raiders hitting elven caravans who would in turn sell him off again. He finally ended his journey as a captive slave in the Silt Sea port of Balic. While Balic hosts one of the larger populaces, you can only show off a trinket so many times before the socialites become bored of it. Having lost his place as his newest owner's new toy, Tawil was hauled off to the docks to work as an extra set of hands on his master's silt skimmers. While it was expected that Tawil would immediately be snatched off the deck by a silt horror, much to everyone's surprise he thrived. His training under the mountain hermits gave him an edge on predicting attacks before they'd happen and the quirk of his avian biology allowed him to echo the calls of the horrors on occasion soothing them away from the expensive skimmers. His time on the deck honed Tawil's prowess with a blade, his skills rising to a level that made it apparent to his master that the Aarakocra wouldn't easily be handed off again, what little emotional conditioning left on his slave having worn razor thin. Rather than wait for the worst to happen, Tawil's master struck while the iron was hot and set Tawil up as Athas' newest merchant, dangerous enough to actually brave the trading routes while expendable enough that he wouldn't be missed when some critter snapped him up. Years of building his reputation and defending his trade along the Road of Kings have passed, and now Tawil finds himself sitting in Daclamitus' home. He himself wasn't sure why he was invited, but Daclamitus was well aware that Tawil had made dangerous and powerful connections, some of the papers in this very room procured through those contacts, swiped by suicidal Paper Wasps out from under the nose of Lalali-Puy herself. Tawil sits still and silent as the dead while Daclamitus lays out the reasons he'd summoned the assembled, he doesn't quite believe the man's bold claims, but there's a niggling feeling in the back of his mind. Tawil still remembers his childhoos on the mountainside, not pleasant by any means but it had been teaming with life and an abundance of food in the early days. Tawil was a relatively successful trader and by no means poorly off, but even he stumbled when confronted with the choice of returning to his everyday life and denying everyone on Athas the lifestyle he had in his youth. Artful Dodger: + CHA Mod (4) vs OAs. Catstep Boots: Take half damage from falls and always land on my feet. Cunning Stalker: CA vs targets with no creatures, or only me, adjacent to them. Flock Effect: +3 to hit when flanking instead of +2. Gambler's Suit: If under 2 save ends effects I can take a +2/-2 to saves respectively. Light Blade Expertise: +2 untyped damage vs CA'd targets. Light Blade Precision: +2 untyped damage to large+ enemies. Silt Rat: Enemies don't gain a bonus to hit me with combat advantage. Two-Weapon Opening: Free Action MBA with offhand on crit with primary. Acrobat's Escape(React) Big hitter moves adjacent- immobilized(somnt) I shift 6. Gambler's Suit(Interrupt)  Non-minion crits me-> Reroll. Strikebacks(React) Non-minion hits me->MBA vs them. Getting ready to app a Warlock|Executioner hybrid. Changed my mind, gonna make something else. The exact nature of Khamsin's genesis is unknown, but even if his mother had wanted to tell him, she didn't have much opportunity: when "Kam" was just a boy, his community was overrun by a savage band of halfling raiders. He must not have tasted very good, however, as he was left alive, sans for a few pieces of missing flesh, and not much memory of what had transpired in his life up to that point. His elemental ancestry was the only thing that saved him as he wandered the desert, looking for any signs of life. He was eventually found by a passing trade caravan, who found him huddled next to the dead carcass of a tembo, but whether this was good fortune or not is a matter for debate, as he was quickly sold into slavery, eventually winding up in the gladiatorial arenas of Balic, under the ownership of Sanozar Simoom. Originally prized for his hearty resistance and ability to withstand the elements, able to outlast his opponents and winning his early fights handily, the other slave owners began complaining to Sanozar that their fighters were not facing fair competition. Sanozar paid them no heed... at least until assassins began coming in the middle of the night to take out the competition, or at the very least, the one pulling his strings. While Kam was able to protect them both, a change of tactics was declared: Kam would no longer fight in the arena. 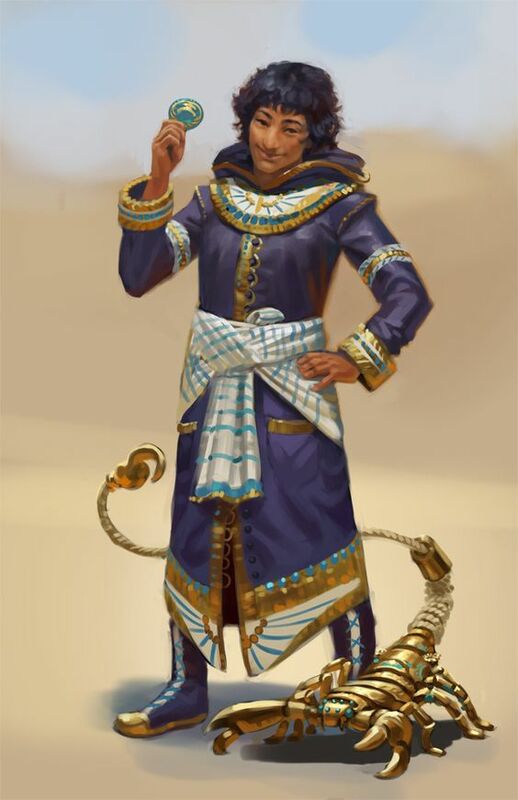 Not wanting to lose out on his considerable investment, Sanozar put Kam in charge of training his other slaves, so that they might show in the arena half the talent and ability he did. Kam showed an amazing aptitude for tactics, keeping both his brain and brawn as sharp as his sword in near constant training sessions, and under his tutelage, his fighters strung up an impressive string of wins. With an equally impressive string of bets on these fights, Kam eventually won enough money to purchase his freedom from Sanozar, who had made more than enough of his own money through his many victories, and allowed Kam to part on friendly terms. Kam, rather unsure of what to do with his life, having far outlived the life expectancy of the average gladiator, eventually found work on the Sirocco Runner, a trading vessel running the silt roads of the Athasian wastes, serving in much the same role he did at the arena: providing combat training and tactical strategy, but with less risk of death and greater profit... relatively speaking, of course. That's the wastelands for you, after all. Exceptionally smooth skinned, like stone wind lashed after millennia of stone abrasion, Kam has become exceptionally skilled over the years at hiding his elemental ancestry, and looks, for the most part, like a normal tall, athletic, Athas-toned human. However, those who know to look notice that Kam's skin color changes to take on personalities of the surrounding terrain: Dune Tan, Obsidian Black, Bone Gray, Silt Brown. These changes are subconscious and instantaneous, despite Kam's attempts to repress this reflex. In moments of extreme stress, Kam's control over his appearance weakens, with smooth skin being disrupted like a windswept desert, and his skin color gives way from slight shading to full blown color shifts. Kam is normally anything but stone-faced: yelling words of encouragement to his allies to keep on fighting long after their bodies would normally have succumbed to the rigors of life on Athas, shouting tactical assignments to change the shape of the battlefield and turn the tide, laughing in the face of his defeated enemies, and arguing with those who disagree with his flawless advice. In his down time, he works through training exercises with the members of the caravan, ensuring they are better prepared the next time they are inevitably beset upon, helps the caravan navigators determine where their enemies would logically attack them from on their upcoming routes, and sitting around the campfire, trading battle stories with anyone who can bear to listen to them. Kam's sword crafted from bone is not unique, but he has perfected the ability of commanding a fine string of sand to wrap around it's hilt, allowing him to retrieve the sword after throwing it at his enemies. His tembo hide and chitin armor and kestrekel feather banner bear the symbols of his former gladiatorial arena, as well as well as a tally of battles won, giving extra incentive to those who hear his battle shouts and tactical orders to heed them. His skilled hands have patched up many a gladiator in the arena, and Kam has learned how to give even of himself in order to heal the gravest of injuries. Finally, in times of great peril, he can command surrounding sand to clump and harden on his head, softening the blows of his enemies, or on his fists and feet, allowing him to strike his foes even harder. Kam gained immeasurable experience working his way up the ranks of the gladiators of the Balician Arena, and coming up with strategy to lead his comrades into victory in battle. Outside the arena's walls and on-board the Sirocco Runner, Kam has faced all sorts of challenges, from bandits, marauders, cannibals, and the untold number of beasts who live in the wastes. Besides becoming the reigning champion gladiator in the Balician Arena, which brought its fair share of notoriety, Kam's has traveled to many places on-board the Sirocco Runner, which, under his guidance, has become one of the premier trading vessels of the region, with many smaller outposts relying on it's capable crew to transport supplies to places other trading groups fear to tread. Kam has seen a lot of the worst parts of Athas, and while he's personally overcome his own hardships, everyday he sees people who are irrevocably stuck. If Daclamitus can achieve even a tenth of what he claims, Kam wants to be a part of that. As a former slave himself, there is nothing that Kam would like to see more than the abolition of slavery in Athas. A good jumping off point for this may be making the world safer for trade like that that the Sirocco Runner participates in, helping economies to connect and grow and reduce the need for such barbarity. Kam encounters an elemental, perhaps even his "father", and learns more about his heritage. Level 11, Good, 6'2", 225 lbs. You, and allies within 10 that see and hear you, gain +2 to initiative. Choose a Presence benefit; provides bonuses with certain powers. Ally you can see that spends an action point to attack gains bonus to attack: 1/2 Int mod. Use inspiring word as an encounter (special) power, minor action. I was not born of this world. Though, as the spirits now tell me, that is fair to say of any of us, any who have truly been born amidst the splendor of the jungle, the ravaging certainty of death in the wastes below. They are correct, as they usually are, but in my case, it is fair to say that there is an exception. I was born when Kol-Tukulg erupted. The volcano and its guardian were not pleased by the sacrifices offered to it. Weak of stock, ill-fit to satiate the great spirits' hunger. So, amidst ash, dust, and molten lava, I arose. I towered over those tribesmen. I towered over all who stood before me. Those who dared offer such weak sacrifices were put down, and those who did not wish to die offered themselves as servants of the spirits, of this impossibly large guardian of the Tread. They served as best they could. The volcano, the great spirits inside, claimed that it was time for us to shape the destiny of this world. Though I was not born among it, I was born within it, and I can feel my connection to the stone, the ash, the dust, the rocks grow ever stronger. Once the Forest Ridge had been sufficiently educated on its failure, I was to await the moon's alignment at the Temple. The Yuan-Ti welcomed me as the herald of a new Age, and so my stay was comfortable, for a time. but also could not possibly have made it purely as a mortal. What lurked at the bottom...was nothing. The spirits had sent me down this far, and would expect me to take a literal leap of faith down to the world below. So I did. Thousands of feet, the sky rushing around me. I felt no fear. I felt only the strength the spirits had granted me, the determination to see their great plan come to fruition. The earth cushioned my landing, and so I had arrived. It was a new world. I, Jatawe, as I was named by the Tread, had a great destiny to fulfill here. But destiny, as the case may be, has a strange way of manifesting. What was left for me was to move. One step forward at at time, into the great wastes of Athas, the cities where anything was possible. I was born to do this. I would save this world. Because it was my destiny. Some would say that my greatest 'exploit' was my birth. After all, the Tread should not have had enough power to create a living being, let alone one so attuned to the world. But this question refers to deeds of valor, and not merely of circumstance. I subjugated the tribes of the Forest Ridge, a place once though to be too chaotic to ever see organization. It would be fair to say that I became a god. The Tread's Champion, the Herald of the Age of Earth, the Savior of Athas. These were the names they called me. But this was merely the life I lived before I came down to Athas. How did Daclamitus hear of you? Why did you respond to his request? After my arrival, it did not take long before others came looking for me. The Man Who Lept from the Sky. My reputation did not follow me down, but my strength, my connection to this world only grew as I did, closer to the mountains, the rough-hewn stone. The tribes had struggles, concerns. I looked as one of their half-giants, and so I became their envoy, their emissary. I did not know these people, but grew to welcome them as my own. The spirits were pleased that I could do so. Daclamitus presented an opportunity. The Tread had whispered of such an occasion. While the tribes, those who lived on the world's periphery could be a concern, this represented a greater cause. It was finally time to save this world. My destiny awaited. To call it 'one thing' would be a gross misrepresentation, but I suppose I can summarize. This world has become corrupted, has lost its sense of balance, of purpose. We grow farther from the earth every day, and we lose respect for the spirits. Defiled by magic, eroded by greed and other base desires, it sickens the Tread, and so it sickens me. How long could this depravity continue before we utterly destroy ourselves? This is my purpose. To set this world on a different path, to save it from itself. "Noble blood is an accident of fortune; noble actions characterize the great." A wise man once said that to me - back in the time when king Kalak still reigned. I knew little of rebellion, then. I was a simple nobleman, who made his fortune in the trade of spices. Certainly, I knew how to fence. Most nobles did. I had some latent abilities of the mind, though I never developed them. I knew of Kings and Queens, of history and economics, of philosophy and of politics. But I was complacent. Aware of the evil around me, I did nothing - I simply subsisted, took care of my family, and let the world pass me by. And then, everything changed. Kalak died. No longer was the sorcerer-king in charge, and all our ways as we knew them were erased. For better and for worse. Slaves were given freedom and wages as laborers, certainly. Trade was rocky for a while, but flourished eventually - everyone wants their food to tastes good. But more importantly, our city came to be under siege. Not literally - the other city states had no such temerity - but year after year, skirmishes, raiders and monsters plagued our walls. The council argued, vying for their secret agendas. I lost many caravans and spice farms. My fortune lessened. So I did what I had to. Mercenaries had other concerns than to put their lives on the line for an insignificant spice merchant, even a noble one. I signed up for the militia. They laughed at me, the old fat man with the chortle in his voice. So I challenged one to a duel. I lost it, of course - but they had stopped laughing when they saw me in action, and that was enough. My skills improved over time. I dedicated time to meditation, to exercise and awaken my latent psionic abilities. Eventually, I found that my mind was stronger than my body, so I gave up the sword, and let my mind rule my fights. 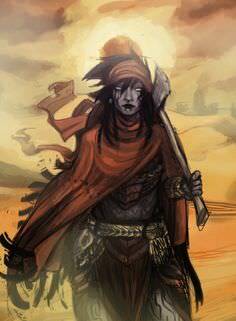 Thus with thought, I slew the desert giant Dunestrider, when he bellowed for Tyr to submit. Thus with thought I brought low a pack of Tembo, with the aid of the militia, after the vile creatures had been bold enough to prey on a settlement of ours. The people took note of my desire to protect them - they called me Baba, "father", for I took care of them as I would my own children. I found a certain satisfaction in this new life of adventure - to avenge the fallen, to protect the weak. It was certainly more stimulating than the spice trade. But I was an old man, and I would not be long for this world...or so I thought. I imagine master Daclamitus called upon me for my psionic abilities. I imagine he heard of me through these deeds of protection I performed. It doesn't matter. If what he says is true, if Athas can be verdant again - I won't know if I will see it, but it is enough for me to know that my children's children, and their children, will sup on fresh fruit without being gouged for all their worth. That they will drink water, and bathe in it, and play in it like the youth does now in the sand. For something like that, I will certainly answer the call, even if it may be my last. The great kingdoms of the Feywild, shining spires between the Real and Unreal. A realm of mystic, wonder, and beauty. A realm long diminnished. The Fey Lords, the Eladrin, withdrew to their shrinking kingdom as Athas killed itself. Thus for thousands of years they watched, and peeked out to the world. Their goal to staunch the bleeding. It was this world that little Grucelle was born. However, it was not the world she would be in for long. Her parents took her out with them to an excursion to the Outside. Why she can no longer remember, but it was a mistake that they had long paid for. They died to raiders, and young Grucelle was enslaved. The novelty of an Eladrin slave fetched her a high price. If only for her mysterious senses and teleportation ability. Originally a personal attendant to wealthy nobleman, her fate would take a different cource few short years later. Her master, however, was not one to waste talent. He saw the rage in Grucelle, and he saw the potential. He immediately comissioned work for training her as a Gladiator. She would earn him fame in the The Stadium. Grucelle wonders sometimes if her master regrets not killing her that day once she kicked a hole in his chest and just before she crushed his head between her hands. But most of the time she dosn't give a gently caress what he thought anymore. You try winning brutal gladitorial fights constantly and see if you don't become badass. 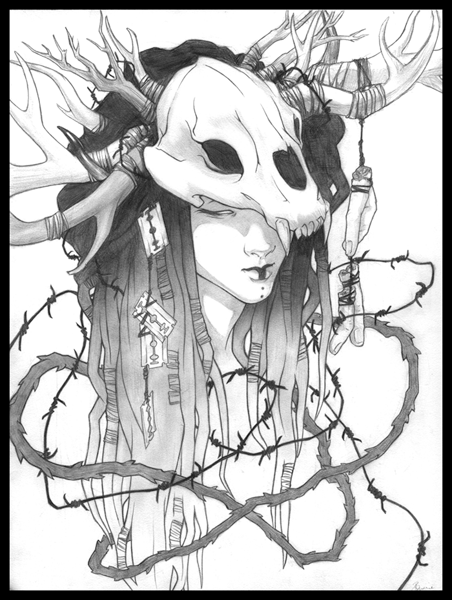 She's known as "Grucelle the Gruesome: for a reason. Her fighting style is brutal. She doesn't use weapons because she doesn't need them. Monsters, men, anything fell before her. And earned lots of wealth for her master. But ultimately she would have simply been one of many Slave Gladiators. Respected, strong, but would not have a major impact on the world. But then she freed the slaves of Tyr. Of course, Grucelle wouldn't put it that way even if all the freemen would. What happened in that the chaos following the death of the Sorcerer King Kalak is that Grucelle had decided she had enough of being a slave, and killed her master. This set off a slave rebellion. Slaves casting down their masters as the social order was upheaved. Ultimately King Tithian outlawed slavery in Tyr. Grucelle doubts it was out of the goodness of his heart, rather it was a way to get the rebellion on his side and help consolidate his power. But she's fine with that, as long as she and her fellow slaves are free she's fine. She's mostly retired from the Stadium since. Only making a handfull appearances, always to cheering crowds. Yet here it is, this letter. Written all nice and neatly asking me to meet him. Honestly I was pretty sure it was a trap until I saw the letter mention the Feywild. In all my years in this sandy hellhole nobody's mentioned that place by name before him. So I had to come. If he can fix this place I'm going to help him dammit. "No slaves anywhere. Nobody should have to put up with your entire life tied to the whims of one sick fucker. If the world's a better place, with nature everywhere and plenty for all... surely that'll lead to a place where nobody will even want slaves?" Inescapable Hold: Whenever an enemy is grabbed attempts to escape it always must make its check against Fortitude. Vicious Advantage: Gain combat advantage against immovilized or slowed targets. Pin Down: A prone target grabbed can't stand until the grab is ended. Shaiha Nilil is a doctor. It's a powerful title in the dying, desperate world of Athas, and one Shaiha has made to serve her just as she has served others. 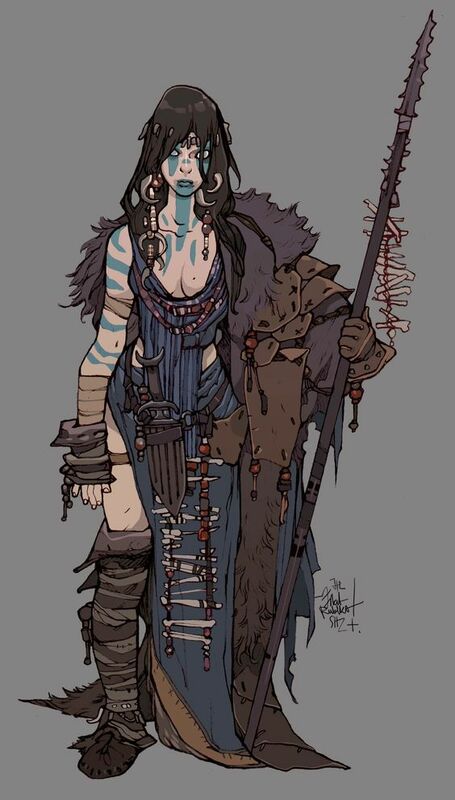 As a youth in the wastelands, she bartered treatment of sun sickness and animal bites for caravan membership and protection. As a young woman, her services in a Draji military triage camp earned her citizenship in the fertile city. As an adult, her notoriety as a healer let her stay the mob's wrath when she was occasionally discovered practicing arcane magic. As the years passed, demand for her skills continued to grow. Ever wealthier and more influential clients demanded her time. It didn't always make things easy - increased demand also saw an increased number of surgeries performed at knifepoint - but on the whole, she could count herself far more fortunate than most Athasians. It was in this milieu that she met someone who would shape the most recent course of her life. A noblewoman by the name of Dejera Seba, suffering a puzzling array of symptoms and seemingly on death's door, burst into her clinic one particularly sweltering afternoon. 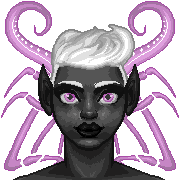 After a long process running through probable diagnoses, possible diagnoses and obscure illnesses, Shaiha came to realize that Dejera was in fact suffering from an ancient curse. Plumbing the depths of her arcane knowledge, Shaiha managed to dispel the curse, just barely saving Dejera's life. Dejera came to a few hours later with a proposition for Shaiha. The noblewoman had been seeking out and exploring ancient ruins, looking for sites from a time when Athas was a lush, green world. She was convinced that there had to be some way to restore the world to this state, and that the clues would be found in the ruins and relics of the time. Exploring such places, however, was often a deadly business. Having just experienced first-hand the value of a skilled healer, Dejera offered Shaiha a place on her expedition team. It was a difficult choice for Shaiha to make. Running off into ancient desert ruins would mean she had to leave her clinic behind, and with it the people she was able to help. However, Shaiha knew, as a doctor, that the best treatment was not for the symptoms. And the symptoms of the dying world of Athas, all the evils, the misfortune and the suffering, were just that. The treatment Athas truly needed was for the cause. The scarcity and desiccation that made the world so cruel, that made it so easy for those with control of the world's scant resources to exploit the many. Dejera's offer made sense, and her small collection of pre-defilement artifacts made Shaiha think she might actually be on to something. It thus came to pass that Shaiha, along with Dejera and a small crew of retainers, left to investigate the promise of a nearby ruin. It has been promise that has characterized the most recent years of Shaiha's life, though increasingly tinged with a creeping sense of disillusionment. A few of her team's expeditions have led to pre-defilement ruins, and with them comes always the promise of discovery. Yet, despite learning quite a bit about arcane magic, she finds herself not much closer to learning how to restore Athas. On top of that, though it pains her to admit it, she's been questioning Dejera's commitment to their own claimed cause. The noblewoman never seems to be as bothered as her at their lack of progress, seemingly content to leave the ruins with a cartload of expensive relics. Shaiha now finds herself back in Draj, taking some downtime between expeditions. Reclining amid her own small but growing collection of artifacts, she should be relaxed, but she's unable to shake the feeling that she's been wasting her time. What makes matters more complicated is the letter she holds in her hands. An unassuming letter, written by a "Daclamitus". An unfamiliar name, making promises she's learning even now to become more wary of. She should just throw it out. And yet, she thinks, there's something curious about a perfect stranger calling on her now, now that she hasn't operated a permanent clinic in years, now that she's been learning so much of arcane lore and aeons past. There's something enticing about the address on the back of the letter - surely a hermit would want her help for something other than just enriching themselves. She has to admit to herself, as well, that she's never hesitated before to leave an old life behind when she had the chance. And the place isn't even that far away. She may as well make the house call. I am Jascha. I am judaga--a headhunter. I am good at what I do because, if I am not, I will die. Such is this world. I do not know if I was born in Gulg or brought there by my owners. I am told I was sold to the Dobrost clan before I could walk. I do not know my parents, nor what they traded me for. I answered to Vico, one of the huntmasters. There were other children, too. We were the lucky ones, Vico told us. We would not be slaves. He said we would be grand hunters, masters of the wastes. We would be strong, and we would put the weak in their place. We would bring our betters glory and wealth, and we, too, would be rewarded. We would be judaga. And so we were. Those that returned from being thrown to the wastes, those that kept out of sight of the huntmasters' beasts, those that survived, we were tasked with bringing new stock to our clan. Vico reminded us that day that we were the lucky ones: we would be the ones outside the cage. I am judaga, and I am good at what I do. I earned this brand I wear, this mark of what I've done. I have hunted men, dwarf, elf, goliath, kreen, and all manner of beasts. I brought them to my masters, because it was the only way I knew, and because it kept me outside the cage--but life is many cages, I know that now. I did this work for years, sending scores of the 'weak' to a terrible end. But one day the Dobrost's younger heir, Vojzek, dared to defy his family, his clan, his entire world. He dared the slaves to rise up and cast off their bonds, in defiance of his kin. We were far from the city, then. He thought they could escape into the wastes and disappear. At first, only a few slaves dared to stand up and cry out. The huntmasters sent their beasts after them, but they still raged. The voices grew louder. Soon, we were surrounded by furious cries. As Vojzek and his conspirators broke open the slave pens and fought off the guards, it looked as though he could succeed... but then Tolyak appeared. The elder Dobrost son, Tolyak towered over Vojzek, and behind him marched an army of slavers. The slavers rushed forth and crashed against the sea of rebelling slaves, tearing through the masses. Bodies of rebels littered the ground, the sand soaked dark with blood. Tolyak met Vojzek, and the brothers fought. The elder outclassed the younger in every way, and Vojzek collapsed to his knees, covered in bleeding wounds from Tolyak's barbed whips. And as the smaller dray sat helpless, Tolyak stayed his hand, refusing to kill his brother. The Dobrost clan would not end one of its own. But Athas does not look kindly upon pity. Bloodied and beaten, the younger dray suddenly surged with strength, leaping to his feet and drawing his sword across his brother's waist. 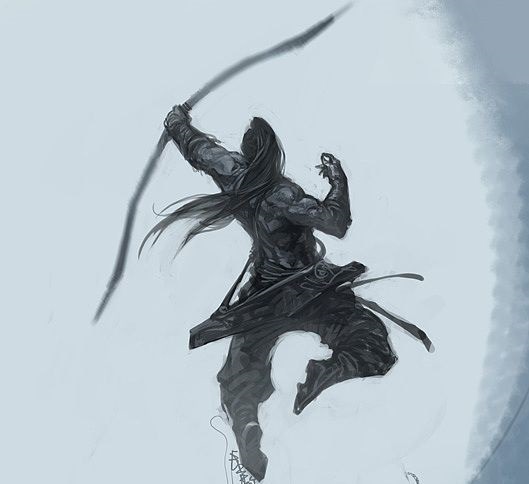 Vojzek's very image seemed to darken as he brought the sword above his head, and then across his brother's neck. And Tolyak's head flew from his shoulders, face fixed staring in horror. The head landed in the sand, facing up toward its killer. 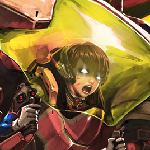 I will never forget the awful sound of Vojzek's roaring cry. The sounds, the bodies, the violence... I was broken. I grabbed my bow and ran. I ran toward the chaos. I nocked an arrow and sent it through a slaver's neck. I drew another and sunk it into the back of one of the huntmasters' drakes. I fired until my quiver ran empty, bringing down slavers and their beasts alike. I drew my sword and cut down more men. I beat open the nearest gate and I ran away, until my legs refused to carry me. I hid in the wastes for weeks. What had I done? Why had I even done it? What would happen to me, to the slaves, and to the Dobrosts? I had no idea, and the uncertainty both terrified and thrilled me. Eventually, I found my way back to the roads. I dared not return to Gulg, for I knew that by then the Dobrosts would have made it back to the city and reported what had happened. Did they even know what I had done? The rebellion had been pure chaos... perhaps my actions escaped notice, but I could not trust it to chance. I made my way to the village of Altaruk and arranged for travel to the city of Raam: a city is chaos is the perfect place to be lost in a crowd. Word of the slave revolt spread quickly, and yet my name never made it to anyone's lips. It seemed I was safe. But what would I do, then, with my newfound freedom? I knew I could not return to hunting the 'weak,' but my life is as a hunter... so I began to hunt the strong. A city in chaos is the perfect place to be lost in a crowd. It was easy to begin targeting the the templars and mansabdars, as they were also targets of the rioters and rebels. In time I grew more bold, hunting nobles and others farther from the areas controlled by the rebels. The dessicated body of the lord of the arena was found outside the city gates. A few of the Offspring met a mysterious end. Word began to spread that a ghost hunted the sycophants of Abalach-Re. Soon, the strong would cower before me. Everything changed when the news from Tyr arrived. We heard that the weak had bested the strongest of Tyr: the Sorcerer-King Kalak was dead, slain by mere mortals. It seemed the whole world shuddered with the news. The rioting in the streets reached a fever pitch, the violence spreading farther than ever before. I had never seen a city and its people so out of control. It was especially strange, then, when a man calmly approached me, wordlessly handed me a note, and disappeared into the night. I spent years hunting slaves for Clan Dobrost, one of the largest slaver empires on Athas. When the slaves revolted, I... had a change of heart. Now I work to bring down other slavers and, perhaps, even the Sorcerer-Kings. My actions in the Dobrost revolt saved a great number of slaves, but it pales in comparison to the number I put in chains. Since the revolt I've raided trade routes, assassinated templars and nobles in their own cities, and freed my fair share of slaves and gladiators. Earning trust has not come easily when I carry the brand--figuratively and literally--of a slaver headhunter, but my actions have begun to speak loudly enough for some. How did he hear of me? Good question. I've tried to keep a low profile so that no one can link me to my work. Perhaps there are still some surviving slavers of the Dobrost revolt that know what I did there. Or maybe my new contacts have actually had some kind things to say about me? Why did I respond? I suppose curiosity killed the kank. Maybe the invitation was genuine, maybe it was a trap: it wouldn't have been the first time someone set me up. If so, I figured it was best to deal with a potential enemy rather than let them kill me in my sleep later. Strangely, I couldn't find any trace of an ambush when I scouted the area. I watched a handful of others make their way to the same spot, yet none seemed to know one another and there seemed to be no coordination between them. Not an ambush party. If it wasn't an ambush, maybe it really was an invitation... so I went inside. The death of a thousand tyrants. I am no mad king's pawn any longer, and I will stop at nothing to see them fall. The dray. I must find him. - Who/where are Jascha's parents? - Did any slavers survive the Dobrost revolt? Do they know that Jascha turned? - What happened to the Dobrost clan and their slaver empire? - Is Vico the huntmaster still alive? Looking to make a leader of some sort. will have something up tonight or tomorrow night, work allowing. Edit: Sheet's up. 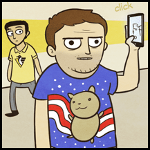 Fluff will be up tomorrow night. Got Ash of the Sands done for now. Human Swarm Druid|Serene Runepriest flavored as a swarm of sand. Will get a background up, and a pdf version of the sheet, tomorrow. Cooking up a human veiled alliance member, probably a sorcerer or wizard. EDIT: On second though, I think I'll sit this one out. The world of Athas is dying. Has been for a long time. Defilers are the cause. The Sorcerer-Kings in particular. Each twisting and perverting the natural world at their whims. Each draining the world dry, bleeding Athas dry, as they perform their foul magic. There are those who can perform the art without leeching off Athas. But they are few and far between compared to those who take the easy and quick path to power. This once verdant land has been overcome in sand. This perversion of nature has continued for too long. Athas is on its deathbed. Yet Athas will not go quietly into the night. Athas will fight back. And that is how I came to be. An orphan with unknown parentage. I was unwanted. I was abandoned. I was thrown out into the wastes. I was young. I could not take care of myself. I had no skills. I had no idea how to survive on the streets, let alone in the burning wastes. I was left in the wastes to die. And I probably should have. I traveled the sands. I was dying of thirst, starving, and my head was pounding in pain. And in that condition I began to hear things, to see things, to feel things. The burning wastes called to me. I found enlightenment in the desert. Wisdom. I survived. I found food and water. At first I could only eat what I could catch, which was not much. But I slowly gained strength, I slowly learned how to survive. And I slowly changed. As the hours turned to days, the days to weeks, and the weeks to months I adapted. I grew stronger. And I changed. My skin was baked. Dried out and cracked. It began to take on the look of sandstone. And as enlightenment overtook me I became one with Athas. My body dispersed into sand. And I could control it. Instead of small bugs and rodents hiding among the rocks I began to hunt bigger game for sustenance. As months turned to years I grew into a man. Though I often did not take the form of one. Leaving my given form for the sands that have sheltered and taught me all these years. I honed my skills. Grew into my abilities that Athas has given me. I occasionally came across others in the desert. Caravans. Raiders. Escaping slaves. I took these opportunities to practice my ability to speak. And to learn about the world I had left. For some I helped. For others I hindered. Slavers and raiders were usually trying to capture or kill me. And their ideals seemed to be against the survival of Athas. Caravans I would often help. I would trade food and hides for various things from the city states. I would learn much from them. I would protect them from raiders. I would guide escaping slaves to freedom, help them get through the burning wastes and to somewhere they could be free. I honed my combat ability fighting slavers and raiders out in the desert. Driving off or killing them as I protected escaping slaves or caravans from their attacks. Or when they came across me and wanted to kill or capture me. Most of these encounters were of course in the desert. But some of these groups proved rather persistent. So I was forced to go after them to dissuade them from continuing. I tracked down raider bases, many of which were hidden in the desert or located in abandoned villages, and cleared them out. Forcing them out into the harsh desert, or killing them. Freeing any captives they may have had, leading said captives to safety. Occasionally I would find a similar camp that was full of slavers rather that raiders. But they primarily seemed to be located in city states. It was a bit harder to deal with them, as they were often an accepted or even promoted part of the city state. The population of these city states seemed to approve of this practice. It was disgusting. Still I would sneak into a city state on occasion, infiltrate a slavery ring one way or another and cause some mayhem to free some slaves. Often this would take place during a gladiatorial event where I could bring about some chaos and lead the gladiatorial fighters into fighting back. These attacks on raiders and slavers, as well as rescuing caravans and escaped slaves, began to happen more often. Word of my actions soon spread. People even began to recognize me, or at least my sand form. The Sorcerer-Kings, or at least their stooges, began to set soldiers and guards out to hunt me down and capture me. Or to kill me. Fighting these groups off brought even more attention to my actions. Daclamitus heard of these fights. Of my freeing gladiatorial slaves, of defeating raiders, of saving caravans. And apparently felt I would be useful in his vision. As for why I responded to his request? His vision seems to be of a green Athas. Of bringing life back to this dying world. How could I not agree? What I want to change? I want defiling to stop. Completely. I want Athas to live again. To restore life to this world. For nature to thrive. Hopefully Daclamitus' plan can bring that about. as silt or water as if they were solid ground. 1/round immediately after I take damage from an enemy's attack I gain 11 temp hp. While in beast form I take 4 less damage from melee and ranged attacks. square away or take ongoing necrotic damage 4 save ends. against that enemy until the start of that enemy's next turn. Human Nature Lore:  Roll twice when rolling for Endurance and Nature checks. beast form that enemy grants CA to me until end of my next turn. enemies granting CA to me. of my next turn, if I am not adjacent the immobilization ends. Preternatural Senses:  Roll twice when rolling for Perception checks. Quick Wild Shape:  Can use Wild Shape power as a free action. Staff Expertise:  Ranged and area attacks don't provoke. 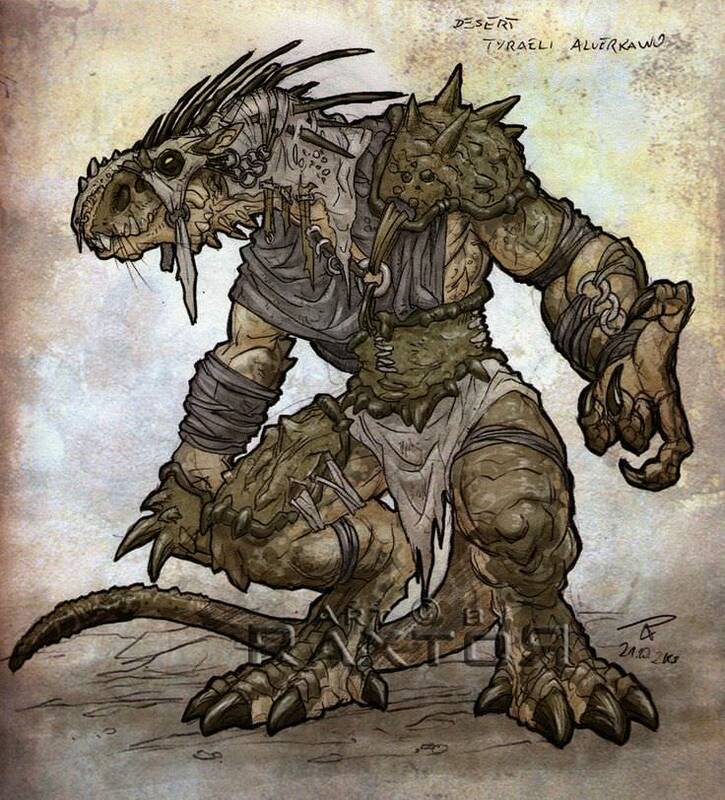 A name unpronounceable by anything with a tongue, this mercenary began life as stolen hatchling, sold off to be used in the gladiator fights common in the arenas of Athas. Far too dangerous in packs, his clutch was separated and he was treated like a caged animal for most of his adolescence. Unfortunately for the gladiators, he proved to be a particularly brutal and vicious fighter, employing any and all tactics to achieve survival through victory. Starving, he'd often use these fights as an opportunity to feed. After defeating the reigning arena champion, Buggy, as he would become known, was purchased by a slave army in the hopes of having a reliable tracker and scout. Buggy's original owners of course played up his "racial tendency" towards those behaviors, deliberately hiding the fact that the Thri-kreen had never been properly socialized or educated by anyone much less by his own kind. He never returned to that mercenary unit after being set loose for his first reconnaissance mission. He would eventually be discovered and rehabilitated by other Thri-kreens who had either been former slaves themselves or had broodmates kidnapped into slavery. However, unlike most of his kind, he never shared an affinity to others, discovering himself uncomfortable in hive life. So, he set out on his own, now as a free-agent mercenary, floating from contract to contract, conflict to conflict, serving in this or that dark sorceror or slaver's army or another. He would earn a reputation as a terrifying frontline fighter, wielding two long sword-like boomerangs carved from the jawbone of a massive desert creature. Allegedly defeating a battalion of men (or a massive warbeast, depending on who's telling the story), he earned the nickname the Swift Desert Mantis. From then on his further exploits in the territorial disputes of slavers and sorcerors would garner more and more recognition - or infamy - as an especially capable fighter. The only kind of work that Buggy could find reminded him too much of his traumatic past. At fifteen years old, he is now a middle-aged Kreen, and has been witness and victim to abuse for nearly his entire life. He would reach his limit one day, seeing a young clutch being broken up and sold much like his own. Disgusted, he killed a slaver, triggering a slave riot that would tear the camp apart. Buggy would be declared a hero of the people that day. Rumors of his exploits must have reached the old man's ears, and Buggy was similarly intrigued by the offer. Is a better world even possible? A world where families aren't broken up by slavers and without hideous monsters lurking in every dark corner. Stories of a place covered not in endless brown dunes and sand but in blue water and green vegetation. Buggy wants to discover if this kind of change is even possible himself. He doesn't want to see one thing change on Athas, he wants to see Athas fundamentally change. Banoc grew up hard on the streets of Nibenay. While crime was the only viable way of life ever offered to the young boy, he took to it with an enthusiasm far beyond necessary. He got big, and he used his size in the service of his bosses, roughing up competition, torturing for information (or fun), and hunting down traitors to the gang. He earned the nickname Basher for his signature bone-breaking club style. While he got what enjoyment he could out of the life, it never completely sat well with him. When the work was at its most brutal, Banoc got through by telling himself that once his street family was in control and wealthy enough, he would be the last street rat that would ever have to do these things. Everyone after him could live the lives of comfort they deserved. Banoc’s mentor in the street tough trade, Jadresh, always made sure they spent their ill-gotten pay in the most lavish ways they could find. He told Banoc everything he wanted to hear about how things were looking up for the gang and the rough days would soon be over. At the same time, he took notice of a young, brawny urchin named Eshunna who seemed to be taking the exact same path through life as he had. The bosses put them together to show her the ropes, and at first their partnership flourished as he told her everything he knew. Putting it into practice, however, was another matter entirely. One day, as Banoc watched her gleefully slit the throat of a merchant who had missed his protection payments one too many times, he realized that something in him had changed. He could no longer reconcile the contradiction in his excuses. There wasn’t a point to his decades of violence; he was just another spot in the cycle. Of course, one doesn’t simply leave a criminal conspiracy. But he was also reluctant to abandon his home. When Basher stopped showing up for his duties and tried looking for honest work, other thugs, many of whom looked up to him as a role model, came to force him back. The old tough sent them home with broken bones, unable to kill people who used to be his family, who admired him. Then, the bosses used their connections in the city guard to finger him for numerous crimes (many of which he had actually committed), sending the city-state itself after him. Never sleeping in the same place twice, always checking every corner and exit, Banoc waged a lonely war against his former employers for years. It was only through the intervention of a group of adventuring foreigners that he was able to win at all. Their leader was a former slave who was traded by his old gang, and their sense of justice provided hope and motivation that Banoc had never felt before. At the same time, his guilt was magnified. He was able to convince the heroes that he could be of use to them, selling secrets in exchange for their aid. They never truly trusted him though, and he saw that as justified. They were fixing problems he had helped create, after all. 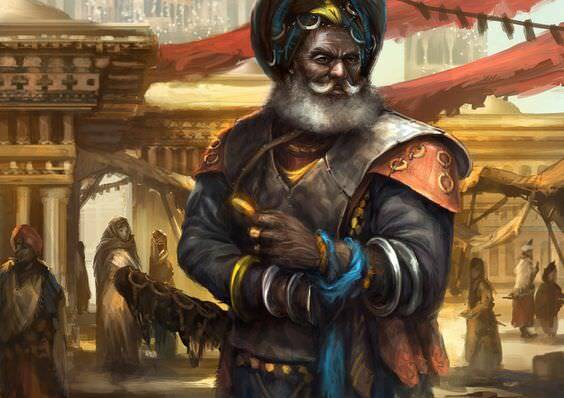 When the dust settled, Jadresh and the other leaders were dead or missing, and the adventurers stayed to ensure that there would be a fairer order in place before they left. They offered to let Banoc lead it, but he refused. The conflict had shown him that he had no place here. He did not deserve the peace he had helped create. Then, as now, he saw himself as just a bodyguard for the actual heroes. The rest of his career has been, from his point of view, being around while the people who are actually good do the real heroic deeds. Watching the backs of archaeologists, protecting caravans, fighting off raiders, freeing slaves- whatever the job is, he tries to find work that will let him help the most people, even if they pay less than others, which is most of the time. After all, it’s not just his own lifetime of evil he has to make up for, it’s the lifetimes of those he showed that path to as well. Eshunna still lives, but she is furious at him for ruining her “family.” Banoc leaves care packages of food and money for her and other kids like her, but that only enrages her further. He hopes he never has to return to Nibenay, or at least that when he does, he will have saved enough people to repent for his wasted life. If he has, he will gladly allow his former protege to kill him. “I just put what I’ve learned to use while my clients discover ruins and save people and all that. I’m not proud of how well I know how to make people hurt, but it’s the only thing I’ve ever been good at. Might as well use it. It felt good to liberate that sorcerer-run monster bloodsport arena in Draj, and I can’t say I didn’t feel a touch of awe when the group I was guarding found a long-lost spring and the beautiful plants growing around it… But then I thought of the trail of blood I left getting there, and went back on the road." “Oh yeah, I remember that guy. I’ve worked with him before, finding a lost scroll or something. He was a bit pie-in-the-sky even back then, and I gotta say… This thing about making Athas green, I dunno. It sounds unreal, but if I could help make it happen… that might be the absolution I need. Maybe there wouldn’t have to be any more me’s fighting over scraps if there was enough food to go around." Choking, quick with the Heimlich! E’anice. 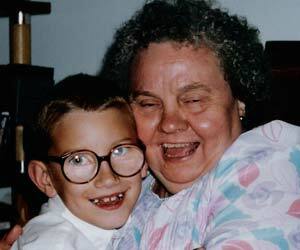 That’s what she remembers her family called her. She can’t remember their names, not now, or even their faces. Especially after all these dusty days spent traveling from great city to great city, the sweltering press of flesh, and the overwhelming stench of spice and dung mixing into that intoxicating aroma of civilization that signals fortune and fame. E’anice has been on the road with the Dragon’s Dancers ever since they found the wounded and maimed child dying on the road between Urik and Tyr. Nursed back to health (but not whole) by the troupe’s healer Devyn, she was put to work cooking and cleaning. That’s all the troupe’s leader thought she was good for, but eventually hard times fell on the company. After that first bout with the Kreen, on which Devyn had staked his entire fortune, the Dragon’s Dancers had a change of leadership. And E’anice had found a home and new family. From the trunk lined enclosures in Gulg to the marble palisades in Balic, Half-Dead whirled and side stepped her way to infamy, leaving enough blood stained sand in her wake to nurture even the driest scrub land to a verdant oasis. It took awhile for her opponents to know to fear her, the slight half-elf with only one good arm. The other, lifeless appendage seemed to dangle useless at her side. Only when she began to dance did it become something more. She used it like a whip at times, flinging it out like a snake’s body, to scream past a face, a groin, a throat, and leaving a single cut so thin that most opponents were dead on their feet, just waiting for their arterial spurts to slow to a trickle, the confident smile turning to a confused grimace, and finally, emptiness. E’anice is a Jaszt Dancer. E’anice might just be THE Jaszt Dancer. And just like Athas, she’s making the most of her maimed existence. Simply winning in the arena isn’t enough. Oh sure, it has its moments such as taking a new breath after your opponent has taken their last. But you need to ENTERTAIN. Half-Dead never half assed a fight. Every encounter was met with a dazzling display of grace, speed, and precision. Her latest claim to fame occurred in Urik, and in a rare public appearance King Hamanu graced his people with his presence. There E’anice took on three battle hardened half-giants single handedly. Literally. Spinning herself around, she created enough of a dust cloud to slip quickly behind each hulking thug and sever their Achilles tendons. As they bellowed in pain and rage on their knees, she leapt from shoulder to shoulder leaving open carotid arteries in her wake. Her rhythmic dance ended with a low bow before the sorcerer king’s veiled canopy, timed to coincide with the collapse of her opponents behind her. As she stood back up, barely breathing at all, the King’s curtains parted slightly as a projectile flashed towards the half-elf, leaving a silver streak of light in the air. She dared not flinch as a shining steel dagger embedded itself in the now blood soaked sand at her feet. A lion’s head adorned the handle. A single word emanated from the billowing enclosure, “Magnificent”. "I'm here, old man. I don't need your money. I don't need your books. I'm here because I'm curious. Why would some dusty poo poo scholar need a Dancer? Sheet forthcoming, if I can find a dang ol' character builder somewheres. Have fun er'rybody, I'll be watching from the shaded section in the stands! "I see dead people. And they loving annoy me." That would be the aforementioned Roaring Rampage of Revenge. “Ungrateful child! I didn’t raise you to be a quitter! Your vengeance will be quenched when I say it’s quenched! If you're on discord I can see about getting you a link to CBLoader! 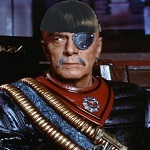 I AM KRIV KHAGAN! STEPPE-HUNTER, MAN-SLAYER, WAR-LEADER! I WAS THE MASTER OF 1000 MEN, ALL KILLERS, DEATH-RIDERS! Now... I am the master of myself and the dirt on my feet. For a time, this land was green enough for my band to graze our animals and water our men. I was found there by my father, Khal Khagan. I know not who left me upon the wastes to die, and I have turned my face from them. I grew into myself, and when my father was slain by the Nomad-Queen I took his sword and severed her breath from her throat. None dared contest me. No more was I "Lizard" or "Boy-" I was Kriv Khagan, chief of the Chitan Riders, ruler of all my army could pick up and take. We stormed the fortress of the Wasn't King, and took from him a wonderous camp that made itself. We slew the village of Reh and took hundreds of cattle. None dared oppose us. The sorcerer-kings cowered in their cities and they feared. Until one of them got smart. Cunning. A plan only a city-monster could devise. A defiler was found, one of power enough. In the green steppe, a spell was cast, and I watched my riders burn as our home withered to dust. Those who survived and I journeyed on as we could, but in time, they found other tribes, or died of thirst and fear, or left for the center desert to face the sky. Now, I am alone again. Abandoned to the wastes as I was when I was born. I debased myself to mere mercenary work, leading cowards and stringy youths for food, for survival. it was at some point, drunk around the fire of a camp that did not compare to a long-bartered wonder, that I poured my story into the ear of a man who claimed his master, far Daclamitus, might again give me purpose. I have no honor left, so I have come to hear you out, soft man. You claim there is another way. If you lie, I will flay your corpse and offer it to the sky, in hopes that the ghosts of my people may rest. I am extremely here for this, I've been missing 4E. I'll need a little time to mull over a character and backstory. Tentatively looking at a Bard carving out freedom and reputation for himself on a harsh world, or a couple of more complicated things I'll need a little time to put together. So, I finally wrote a bio and, uh, it's kinda bigger than I wanted it to be. But I have so many ~story hooks~ that I want to work in and it's late and I dunno. Maybe I'll chop it down, but I may just leave it as-is. My submission should be complete now. Callendi was abandoned on the dunes on his tenth birthday. His parents last words were that he needed to find his own strength, and if the ancient ones were willing they would meet again in the next life. Their words were prophetic; he did indeed find a power within him, granted by a pact older than his memory with unknown and unknowable creatures beyond space and time. He does not know what the ancient ones are or what they want, and can only catch glimpses of them looking up to the stars on a clear night. They are more powerful than even the Sorcerer Kings, he feels, but perhaps even more dangerous. He tries not to dwell on it. 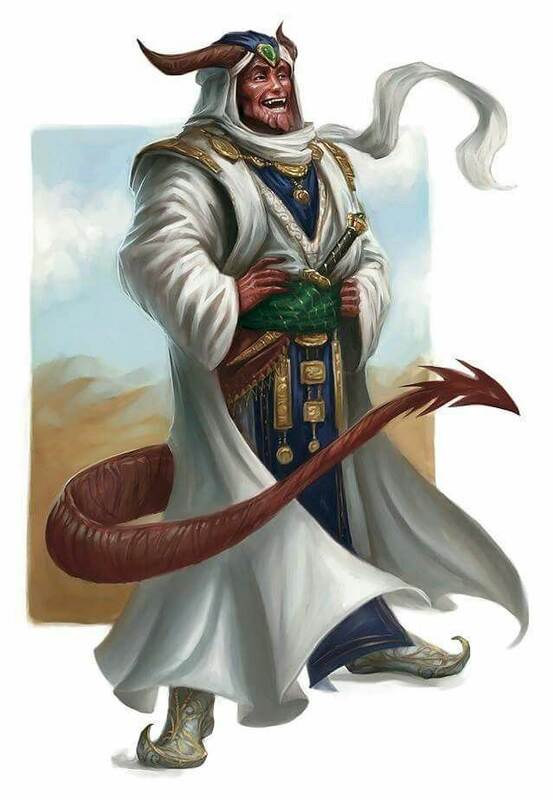 With their power he was able to survive for three months in the deserts alone before being picked up in the nick of time by Veiled Alliance members, who taught him how to conceal his powers and use them carefully. He also learned the art of concealment from them, hiding daggers behind his smile and how to hide a killing intent even as the killing blow was struck. When he became older he was given a cover as a traveling merchant, encouraging trade between the large cities of Athas with a shrewd wit and a silver tongue. No place would bar him entry for long, and once inside a city's walls he would quickly become a friend and confidant of everyone he could. The Sorcerer Kings themselves distrusted him but for all the wrong reasons; each must have believed he was an agent of one of the others, a spy sent to gather information and sow discord. Worth keeping an eye on but too dangerous to kill without knowing exactly who it would piss off. 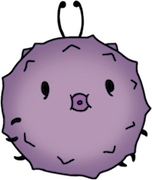 The truth was much worse; he was a so-called "disposable asset" of the Veiled Alliance, a gossamer thread connecting individual cells to one another. Of course he knew very few Alliance members by name or face; one person knowing the membership of several far-flung cells, even someone as talented as he, would be too great a security risk. Instead he merely knew which places to go and what messages to send, knowing the information and orders he brought would somehow end up in the right hands. And of course if there was a dangerous mission to accomplish which needed the utmost secrecy and no witnesses he would receive his orders there as well. I am not so impressive as you seem to think! A good portion of my success I owe to nothing more than good luck. Surviving in the desert for a month with no training or knowledge of how to do so? Fortune! Being found by the exact people who not only would care for a young desert vagabond but one of the few organizations able to train them safely in the arcane arts? Remarkable fortune! Escaping a trap laid by Nibenay's finest? Unbelievable fortune! Not that I sell my talents short, but many are those more talented and skilled than I whose bones now decorate the dunes. If I were to list half my exploits you would call me a liar: prisoners rescued, slavers killed, templars humiliated, I have not kept track of them all. I simply did what was needed and let the memory of it fade away. Your guess is as good as mine, ha ha! I have been trying to keep a low profile and thought I had succeeded right up until that Erestra woman tried to shove a scimitar down my throat. At first I accepted his request to meet under the assumption that I was probably going to have to kill him, but was pleasantly surprised. And, of course, with the Veiled Alliance now closed to me and none left who will miss me I can do what I want to for once. If in all likelihood I'm going to end up dying alone anyway, I might as well die trying to achieve something truly outrageous! It is not the Sorcerer Kings themselves who are the true threat- if they were allowed to die naturally their influence would not last much longer than their reigns. Each of them believes they will live forever, so they didn't craft a society which could survive without them. But that longevity is what made them so dangerous, their magic allowing them to rule forever by allowing the land to rot in their stead. So, that's what I'd like to change! If defilement was no longer possible, if even beings as mighty as the Sorcerer Kings were forced to accept a limited time on this planet, then evil would not be able to hold back the pendulum for as long as it has. But well, that's just the way it seems to me. Courtier: Use Diplomacy for Streetwise and Bluff checks, roll Diplomacy twice and use either result. Mercurial Action: When you spend an action point, speed +1 and also get move action. Mighty Crusader Expertise: Ranged/area attacks made with Holy Symbol do not provoke OAs. Superior Will: Make save vs. daze/stun/dominate at start of turn, even if it is not a SE effect. Hero's Poise: When you succeed at saving throw, allies within 5 get +6 to saving throws USoYNT. I will use Price of Cowardice against that enemy. It was dangerous beyond the walls, Father had always said. It was natural for Isam to be curious about the city...but also pointless. There was nothing worth knowing out there, according to Father, nothing but thieves and parasites and worse, everywhere you looked. So Isam had done as she was told, staying safe inside the ziggurat, reading all of Father's weird old books, taking her medicines even when they hurt, practicing her tricks as hard as she could. And Father had delighted in the power she had learned to call forth on command, telling her that she was special. Not like all the others. The traitors. The failures. One day she would be ready to be Father's sword, and together they would set the whole world right and find true greatness. Father could just see it. Isam could see it too, in ways that Father never knew about, ways that she was careful never to reveal to him. She had snuck out to stand on the roof and take in the thoughts that rose like steam from the city streets. There was ugliness there, to be sure, but most of all there was color, hues and shades that Isam knew no words for, a great dizzying kaleidoscope of ambitions and desires and fears and faith like a brilliant oasis in the endless grey of the desert. Meanwhile, the inside of "Father's" head was never anything but blackness, gloating fantasies of pain and power, twisted and sickening to look upon. Any color that touched him died. And so, when she knew he was making ready to sacrifice the city, Isam stole down into the basement that she wasn't supposed to know about and made some tiny alterations to the ritual circle. And when the ritual failed, and the gates of the ziggurat were battered down, Isam slipped out, unnoticed by the rebel templars charging in to put an end to their mad king. Isam spent some weeks living unseen in the shadows of the city, taking in all its marvelous chaos, quietly finding places where she could steal what she needed without it being missed...only occasionally using her abilities for mischief. Then one day, there was a brand new thought to see. Somewhere, there was a man who thought the wastes could be brought back to life. He was actually serious about returning color to that endless grey. Unable to leave this alone, Isam had found the dark room where he had summoned his chosen champions from all over the Tablelands, sand-pirates and gladiators, renegade mages and princes of the merchant houses. She listened in silence while they struck their deals and laid their plans. And just as the final hands were shook...she made up her mind, and revealed herself to them. Orokos sheet and the PDF. Sathain changes faces and assumed names often. As an agent of the Lords of the Land Within the Wind, he goes from place to place, performing tasks and seeking information. Most commonly, when he is among humans, he appears as a human of middling height, with stern features, close-cropped brown hair, rough stubble, and a crooked smile that makes those on the receiving end feel like they're one of the few to get it out of him. 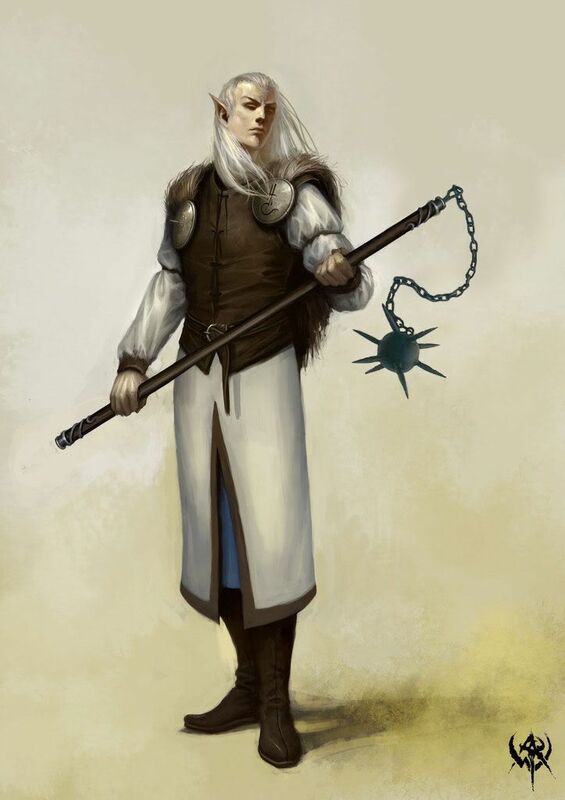 Among the Eladrin, he wears his true form: tall, lean, whipcord over bone, with eyes and hair as grey as steel. Of all of those special agents of the Elders who have been burdened with the knowledge of the terrible secret of the Mirage, he is the one whose sense of humor and ability to take joy in life is the least diminished. Though he has bouts of melancholy, he has succumbed to them less than his brethren. He has lost everything he knows, but he seeks to make up for it as best as he can in the bloody desert. Know then before you die, O defiler, that The Land Within the Wind is dying. It is beyond dying; it draws its last breaths. It has been true since the Green Age ended. At first, it was a slow and unnoticed illness, like a cancer, withering the Land at the edges. Then, it was a shocking discovery--a terrible debate--an accepted crsis. Over the years, the crisis became a grim inevitability: the Land fading away, becoming desert or salt flat or dessicated jungle, peeling away from Athas and being lost to nothingness. Every year, the desert encroached a little more on the lush and verdant Land, and every year, all efforts to counteract it failed. 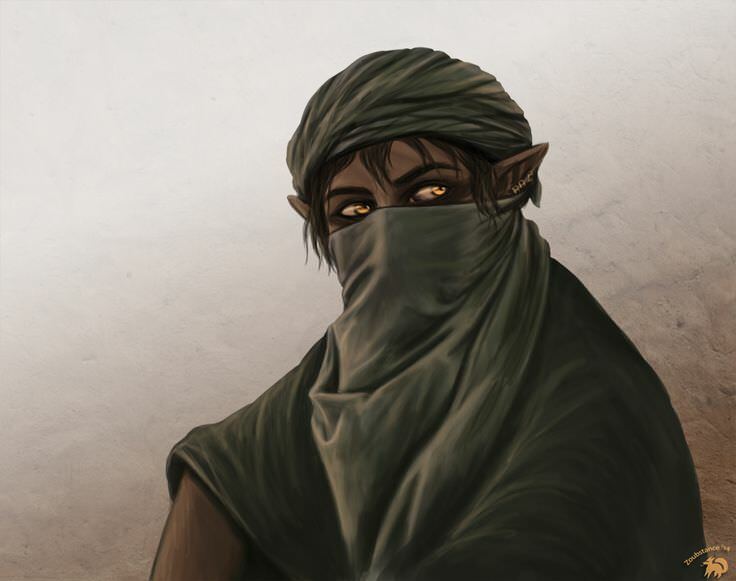 When the Mirage was first devised, many of the Eladrin rejected the idea. It would only be a painful reminder of what they had lost, dissenters said. It would be worse than fading away, some complained. The Mirage was not built. But they all knew it could be, and how it could be done. The inventor of the Mirage did not live to see his idea implemented, but the idea never quite seemed to die. It found at least one powerful proponent in every generation. It took centuries before it was put into effect, but eventually, there was simply not enough green left to do anything else. There were no options, no alternatives. They looked out onto the salt and silt and sand that had once been the Land Within the Wind and, clustered around one of their last oases, one by one they agreed to the idea. The most powerful psions among the Eladrin joined their minds and built the Mirage. Out of memory and heartache and their own life-force they spun everything they had lost: shining oases, spiral towers, jungles full of life and color, ancient forests, babbling brooks. It could be touched, and smelled, and seen, and loved. It could be hidden from the rest of Athas, protected, untouched. In the Mirage, the Eladrin could live their lives, keep their traditions, remember their past and the Green Age lost to them. There are still a few areas of true life within the Land--a single Oasis here, a small copse of trees there--but only the Elders know which ones they are. The Mirage they guard is inviolate and inviolable: the oases they keep travelers away from through illusory veils and mind-tricks and murder are not real. There is no water to drink, there are no flowers to smell, there is no sound of bird or beast. Though you may believe you are draining life from the Land, defiler, you can not truly do so. There is no might to drain. There is only cold psionic might spun into a pattern so convincing that it fools the mind and sustains or destroys the body. For their elders, the greatest minds among them, it is worse than that. Eladrin who live long enough, are strong enough, hone their minds enough inevitably stop succumbing to the Mirage. It becomes a ghost-image, a shadow-play, stops affecting them. They can no longer drink its illusory water and feel their thirst slake; can no longer run their hands through the fur of a great cat or watch a majestic roc soar through the sky. They sustain themselves with their own psionic power, and with scraps of food brought in secret from beyond the Land--and they sustain the Mirage. They do not tell the young. 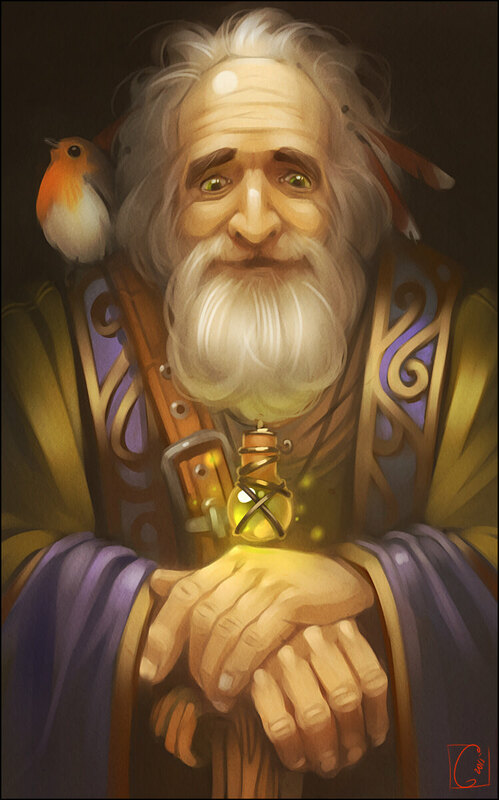 That decision, too, was controversial, but it was decided long ago that letting Eladrin be born with knowledge of the secret would make all their lives hollow, devoid of joy and pride. So each Eladrin learns that the Land and the traditions of their people is inviolate, that they have held on to the greatness of the Green Age, that though the world encroaches on and threatens the Land, there is a solid core within it that has remained undisturbed for thousands of years. They never think to question it: the truth of it is all around them. And when they grow old enough and strong enough, if they do not die by violence or by accident, they grow in power until the veil one day lifts from their eyes, taking what was the reality of centuries with it. They lose the rivers, the grass meadows, the flowering vines, the sound of birdsong. They lose the belief in their people's purpose, the meaning and goal of their lives. They know everything they have been taught for centuries is a lie. What Athas lost over centuries, they lose in a single terrible instant. 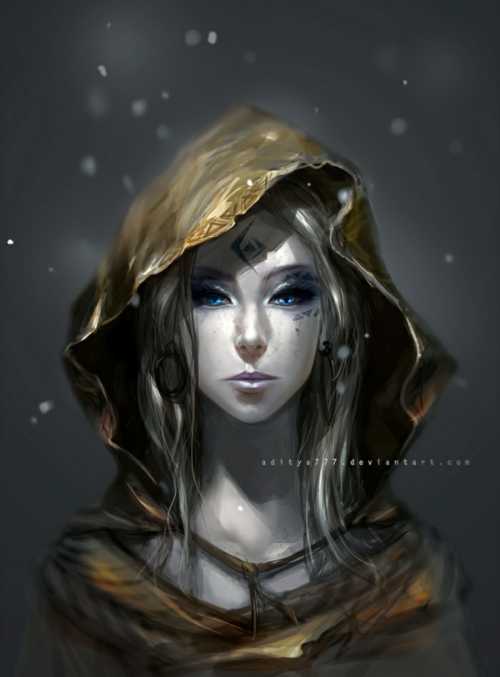 In exchange, they gain only a cold, grim duty, for as long as they can endure it, and there was never a heartbreak in the world as great as each Eladrin Elder experiences when they awaken to the truth and either release their hold on life or commit themselves to a sterile, empty life of powering the Mirage, of recreating the Land Within the Wind that has been lost. Some of them remove their hearts from their chest. 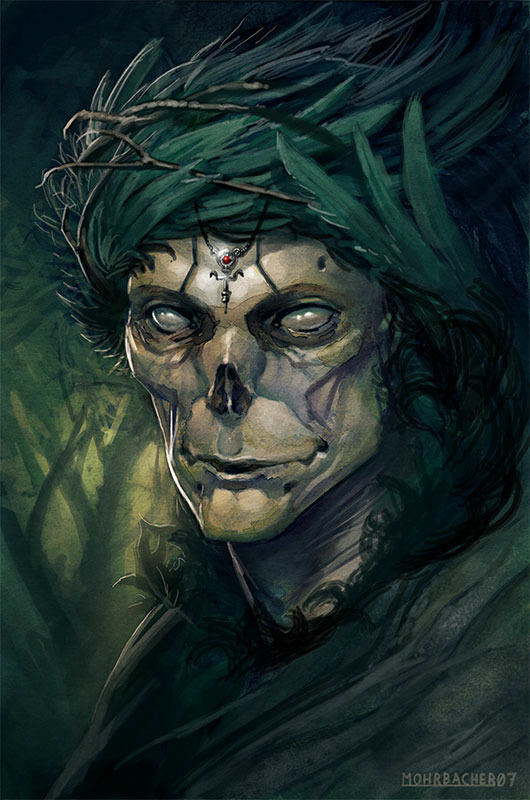 The Lords of the Land Within the Wind--the Veiled Prince, the Windrider, She Who Waits In Darkness, those who rule but are not Elders--they shoulder their duties and make their plans. They plan to protect the oases, to disrupt the plans of sorcerer-kings, to allow select individuals into the Land Within the Wind to learn from the Eladrin. They dispatch assassins, post watchers, sow rumors, make bargains, and they do not know that it is all for nothing, about nothing. The Eladrin stand guard over nothing, protect nothing, secret away nothing. They fight for nothing and they die for nothing. They are trapped in a cycle of illusion and sorrow, the young never to understand the melancholy of their Elders until one day, suddenly, they share it, the Elders doomed to know that only a scattered handful of spots boast the true verdant Life that once covered the Land Within the Wind--and that those, too, will only stand as long as they guard them. If the Elders surrender to sorrow, if they let the secret slip out, if they disrupt the cycle, then what little remains will be lost. I am one of the few besides the Elders who knows the Great Secret, the ultimate lie at the heart of the recreated truth of the Land Within the Wind, and I have been given a great task. Because my father was not one of the People--he was an outsider who had enough respect for the land to be allowed in--I can pass for one of the men of Athas. I travel the world, keeping the Land Within the Wind safe from the machinations of defilers and sorcerer-kings, but I have a purpose above that: to find a way to make the mirage real. 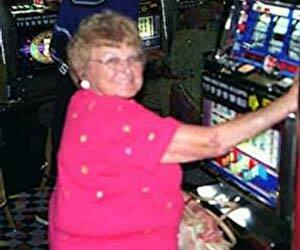 The Mirage is a wonder to rival any accomplishment achieved by the wizards of old; it is so close to life! Perhaps another source of power yet undiscovered would make it truly real. Or perhaps there is a way to restore life to the Land Within the Wind, true life, to replace the Mirage's illusory splendor with something true. I and those like me seek it, because without it, even the Mirage will last only as long as our last oasis, and then it will be gone, and then we will, and Athas will never know. Do not misunderstand me, defiler. I am not so solemn and sorrow-bound as this, usually. I am not an Elder; the Mirage seems real enough to me, and the knowledge that it is not holds only modest sway over the input of my senses, day to day. I can still appreciate its beauty. But here and now, before you die, I can speak my heart on the matter. I can try to make you understand the tragedy of the people you sought to plunder. I can tell you that behind my humor and my charm, behind my smile, my heart is broken, and I have to hope that something on Athas remains that can make it whole. I pride myself on not being recognized for them, but the most daring thing I got away with was impersonating a templar and stealing a tome that was too close to the truth of various locations in the Land Within the Wind from the Sorcerer-King's vault. I laid waste to the templar himself and his servants when they returned early, while I as on my way out. Hamanu fumes about it still! But he is looking for a man who never existed; I made sure of that. I have done other things, too. I have fought in the Arena of Draj in another guise, and lived to tell the tale, and escaped from the pens (along with the woman I went in to rescue). I have gained acceptance in an elven tribe by helping them succeed in a daring heist. I have lied to one of the Mind Lords, mind to mind, and been believed. Daclamitus, of all them, has the most promise. I would find a way to break the tragic cycle of my people. The Mirage must be made real--or else some other, even less likely thing must be found. e: So that turned out super bleak. The character's not all bleak all the time, but once I started figuring out the Eladrin I couldn't stop. Will make a dude eventually. OK, I think I'm entirely done. With that take on the Eladrin, I kind of want to do a Dark Sun novel about a guy who finds out about the Feywild/Land Within the Wind, decides that the Eladrin are selfish assholes who need to share and spends time trying to merge the Feywild and the rest of Athas (under the assumption that all that green will shape the ecosystem into something more vibrant), and eventually learns the Eladrin's terrible secret and has to try to find a solution. e: not entirely done, forgot to answer the questions. I'll do that tomorrow. Updated my sheet, changed to a Tiefling Paladin instead of a Human Paladin|Warlock. All divine powers are still reskinned to warlock/arcane powers. Respectfully pulling my submission from selection. I think y'all are way better at 4e and I would be a drag on the flow. I'll get to Athas yet! Thanks for all the recommendations folks. Besides a minor mechanical tweak I'll get to in the next day, my submission is now complete! If there was a word to describe the Windchaser tribe, it would probably be "opportunistic". Like many of the elves of Athas, they lived in the now of their world, with their surroundings and circumstances dictating their path. They might forage and herd kanks, but turn to raiding when times were lean and trading when they had a surplus of goods of perhaps dubious origin and some viable marks upon which to unload them, and then use the proceeds to rebuild their herds and continue the cycle. Of course, this sort of activity could lead to poor relations with the locals and prompt frequent relocation, which suited the nomadic tribe just fine. 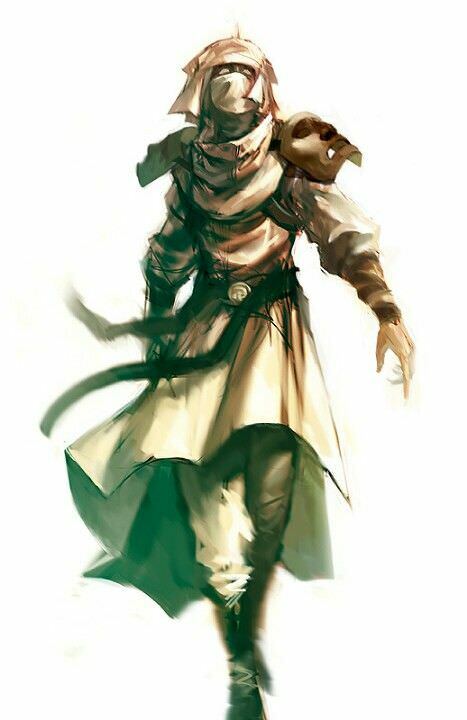 Aelaren Dunerunner was a hunter in the tribe, with a love for exploration and an aptitude for stalking prey. More than simple acquisition of nourishment, a tribal hunter also served as a scout, spotter and advance guard for the tribe when needed, seeking out food, shelter while avoiding or combating the hazards of the wastes. While tracking a flock of Erdlu through the barrens, Aelaren came across a well-hidden cavern entrance. Weary from the hunt, Aelaren investigated the cavern in order to wait out the noontime sun. Though the elf could have merely sat in the shade and waited, Aelaren's curiosity proved too great, and with the light of a torch went deeper into the cave. That curiosity was rewarded with the discovery of a well-carved secret door at the back of the cavern, with a rather delightfully complicated locking mechanism. It took some work, but Aelaren was eventually able to pick the lock and gain access to whatever treasures were so carefully guarded... which turned out to be lichen and scattered wood. Though something else may have cleaned the place out already, Aelaren couldn't be too disappointed- the lichen was perfectly edible and there was even a small pool of water available. Not a bad day's work for a hunter. Aelaren gathered up the loose wood to fashion a new torch, only to discover that one of the lengths of the wood was strangely warm to the touch, and almost seemed to pulse with the heartbeat when held. The elf hurled it away in fright, but after several minutes of nothing happening Aelaren went over and picked it back up, curiosity proving too strong to resist. Investigation didn't reveal anything else, so the hunter merely bundled it up with the rest of the supplies and took it back home. That night, the dreams began. Aelaren had had dreams before of course, but these weren't like the normal ones of victories, dalliances and pleasures. Instead they were dreams of strange beasts, a yellow sun and more green vegetation and blue waters than the elf had seen in a lifetime, dreams that left Aelaren with a pounding heart and a melancholic ache. Aelaren kept the strange stick close, fashioning it into a simple throwing spear, one that seemed to be almost a source of luck for the elf when taken out on hunts. But things didn't always go so well. It was one unfortunate day when Aelaren was in a small hunting party scouting the tablelands when they happened across another hunting party- this one composed of thri-kreen. Things deteriorated quickly. With one of their number swiftly slain, Aelaren and the others were forced to scatter. Already injured, the elf made a tempting target, with three of the insect hunters in pursuit. The rough terrain meant that the the leaping thri-kreen had the advantage, and were soon able to corner their corner their prey. Bloodied and terrified beyond all reason, Aelaren's heart was racing, blood surging into a pounding roar that suddenly seemed to echo from the elf's throat. Teeth sharpened, nails lengthened, muscled limbs became coated with fur as madness fell upon the elf who then fell upon the thri-kreen. Aelaren came to covered in gore with two of the thri-kreen mangled upon the ground and the third nowhere to be seen. The harrowing experience had so frightened the elf that Aelaren dared not return to the rest of the Windchasers, and set off deeper into the wilds, living off the lands and avoiding contact with others. But such a solitary existence ground at the edges of Aelaren's mind, filling it with dark impulses of frenzied action. Aelaren might have succumbed to those urges had the elf not been discovered by Zaril Dustkeeper, a mul druid tending to one of the oases of the Tablelands. Recognizing that the young elf had been touched by primal spirits, Zaril took Aelaren in, serving as mentor and counselor to help the hunter control and develop this fledgling power. Through careful training and meditation, Aelaren learned to quiet and channel those wild urges and draw on the power of both land and beast. It was truly a joyful day when the Windchasers crossed Aelaren's path once more, for the tribe had thought the elf long dead in the thri-kreen ambush. But despite the comforts of home, Aelaren couldn't be content with simple hunting, filled instead with a powerful wanderlust and some deep and undefined urge that propelled the elf to depart the tribe once more, though Aelaren would contact them again whenever they crossed paths. The swift-footed druid would then roam the Tyr region, traveling to cities and ruins, plains and mountains alike. 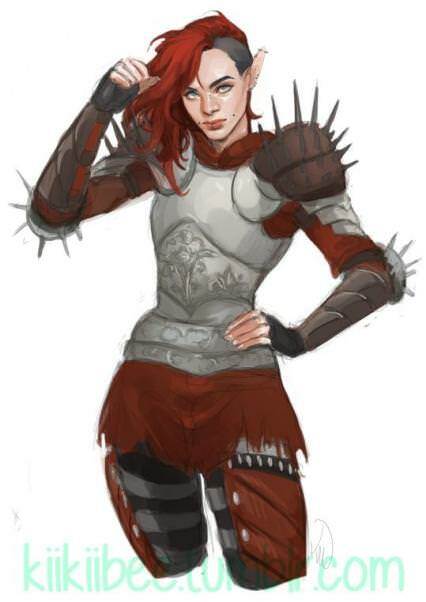 Aelaren most frequently served as an explorer and guide, but also an adventurer and thief, with tasks ranging from leading caravans, hunting beasts and tracking foes to raiding mansions, sabotaging forts and delving tombs. 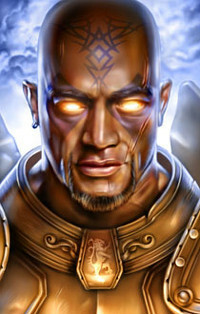 Perhaps Aelaren's proudest accomplishment was the discovery of an old tomb of a preserver for the Veiled Alliance, facing off against the templar Durok and the rest of his force of Hanamu's soldiers in order to buy time for the alliance members to recover the tomb's precious secrets of life magic and escape. Aelaren is an exemplary guide, having ran the breadth of the land from the Ringing Moutains to the Silt Sea, trusting in the power of an elf's swift feet rather than the unreliable nature of a mount. The elf forms bonds quickly and cut them loose just as quickly, favoring a lifestyle free from getting tied down. Usually cheerful, Aelaren delights in living in the moment and seeking enjoyment whenever possible, even when in the middle of a task. In battle, the druid is a whirl of elemental power and bestial might concealed beneath a whirling cloak, capable of toppling even a half-giant with a single blow. Out of combat, Aelaren loves to seek out new experiences and situations, and especially delights in anything that provides new and delicious culinary treats, a luxury the elf can be hard-pressed to create when foraging in the wilds (though Aelaren does make an attempt whenever possible- better a short and pleasant life than a long miserable one). Aelaren is also fond of song and dance, puzzles and games, and anything else that makes the world a more fun and interesting place to live in. 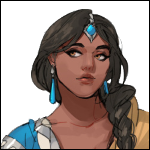 Aelaren loves being self-sufficient and free to travel and explore, and has little patience for chains, slavers and those who would take away that freedom. Aelaren wanders in search of excitement, freedom, and magic that will help acquire those things. But a return to the Green Age though... that would be beyond even Aelaren's wildest dreams. Thank you, everyone, for your apps! This was a really hard decision, and it honestly took me all day to choose. Expect the OP either late tonight or tomorrow. Let's save the world! Lightning Rush: non minion enemy within 5 attacks an ally. Always Augment 1 or 2.